The cochair of a health care advisory panel resigned this week over frustrations with the governor her group was charged with advising. In a scathing letter to Gov. Phil Scott, Mary Val Palumbo accused his administration of ignoring recommendations from the Governor's Health Care Workforce Work Group and attempting to squelch dissent. "Our feedback does not align with the current [Agency of Human Services] stance and budget proposal, and we are being silenced," Palumbo wrote. An associate professor at the University of Vermont's College of Nursing and Health Sciences, Palumbo has led the work group since then-governor Peter Shumlin established it in 2013. 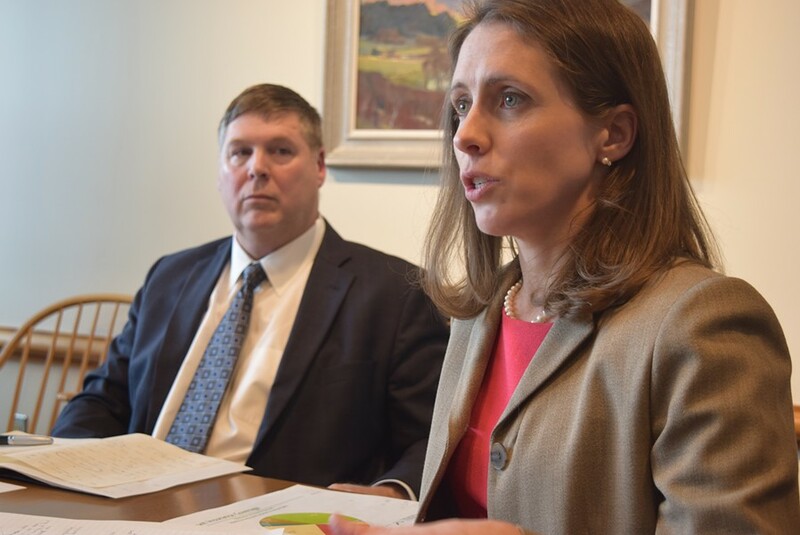 The panel, which includes roughly two dozen health care professionals and administration officials, is charged with recommending approaches to recruit and retain health care workers in Vermont. Another member of the group, Stowe psychologist Rick Barnett, also recently resigned, expressing frustrations similar to Palumbo's. In her letter, which Seven Days obtained Wednesday, Palumbo specifically criticized Scott's proposal to eliminate the Vermont Educational Loan Repayment Program for Health Care Professionals. The $667,000 program — more than half of which is funded by the federal government — helps underserved, mostly rural communities recruit doctors, nurses and dentists. While state officials had previously solicited recommendations from the group, Palumbo wrote, the Scott administration did not provide it an opportunity to weigh in on the latest budget proposal, which included the cut. "In fact, input to the governor from this assembled group of clinicians and workforce experts was recently discouraged," she wrote. Palumbo did not elaborate on that charge in her letter, but she described the incident that led to her resignation in an interview Wednesday. During a meeting of the work group three weeks ago, Palumbo said, she brought a draft letter to Scott advising against the loan repayment budget cut. She hoped to solicit signatures from colleagues on the group and planned to sign it, "Members of the Governor's Health Care Workforce Work Group." But according to Palumbo, Scott's director of health care reform, Mary Kate Mohlman, who cochairs the work group, discouraged her from doing so. "She said that we could not send the letter with the signature 'from the members of the group,'" Palumbo said. "That was not allowed." Mohlman declined to directly address Palumbo's accusation, but she said she pointed out to the group that "it would be more effective" to bring their concerns to legislators, not the governor, since they would be the ones determining whether to move forward with Scott's proposed cut. "I don't agree that they were 'silenced,'" Mohlman said. Scott spokesperson Rebecca Kelley also declined to specifically respond to Palumbo's letter but said in a written statement that the administration had weighed "a range of feedback from individuals and stakeholders on this and many other programs and services." The House Appropriations Committee is expected to finalize its version of the budget on Friday. Rep. Kitty Toll (D-Danville), who chairs the committee, said its members were still debating whether to preserve funding for the loan repayment program. "It's one of the final pieces in play to be considered," she said. Barnett, the Stowe psychologist, also resigned from the work group after its February meeting because, he said, "I didn't feel like the group was effective." Barnett said that he had grown "frustrated" that the panel had done little to address access to mental health and addiction treatment services. Barnett corroborated Palumbo's account of the meeting, though he said Mohlman had been "very diplomatic" in asking the group's members to refrain from sending a joint letter to the governor. Still, he said, "It doesn't make sense that if we are called 'the Governor's Health Care Workforce Work Group' that we can't communicate directly with the governor about stuff related to the work force. It just feels odd." Secretary of Human Services Al Gobeille, whose agency recommended the cut, said he understood Palumbo's frustration but was disappointed that she had chosen to step down. "She should stay there and fight with me because that's healthy," he said, calling Palumbo "an amazingly dedicated" person. "You gotta stay in the game and keep pounding."